iPod In Thailand: How Much Do They Cost? The ubiquitous iPod is as popular in Thailand as it is everywhere else in the world – but is it any cheaper to buy one of Apple’s famed MP3 players in the Land Of Smiles rather than at home? In a word: No. Unfortunately, while Thailand is a shopper’s paradise for many items, electronics aren’t one of them. There are some bargains to be had buying digital cameras in Thailand – but not iPods. You can find stacks of cheap iPods on Ebay which continually beat Bangkok prices. (Scroll down for current Ebay iPod auctions). I did a quick spot check today in Bangkok’s Emporium mall – an 80 gb iPod was retailing for 14,290 Baht. The Emporium, like many ritzy malls, is part of the Tax-Free scheme that lets tourists claim back the 7 per cent tax from their purchases. 7 per cent of 14,290 is conveniently 1001 Baht, so that makes the best price 13,289 Baht. In the UK, an 80 gb iPod currently goes for £197 on Amazon.co.uk. The Thai discounted price of 13,289 Baht is around £203 – so it’s still more expensive. In the USA, an 80 gb iPod currently sells for $322 on Amazon.com. The Thai discounted price of 13,289 Baht is around $404 – so that’s a lot more expensive. Of course, you might want to splash your cash if you see one of the unique themed iPods that have been issued in Thailand, like this iPod for the launch of the first wholly Thai animated movie Khan Kluay (featuring a very cute cartoon baby elephant) and this iPod to commemorate His Majesty The King’s Diamond Jubilee. As far as I can work out, Apple tends to keep a fairly tight control on its prices worldwide, so trying to find big discounts from any source is difficult. Even in Singapore and Hong Kong, renown for their electronics bargains, there are slim pickings to be had. (Although I did by my own 3rd generation iPod in Singapore’s Sim Lim Square a couple of years ago that was definitely cheaper than the UK retail price). The Emporium is quite an upmarket, expensive mall, so it’s possible that you might find cheaper iPods elsewhere in Bangkok, but I doubt they will be significantly cheaper. You should definitely make sure that you buy any Apple products from an authorised Apple store in Thailand. There have been reports of fake iPod Nanos being sold in MBK mall in Bangkok, with tourists buying what seems a bargain for 2600 Baht and getting a very poor quality MP3 player instead. This post was inspired by seeing a fair few people were arriving at Travelhappy after searching Google with the term “ipod Thailand”. 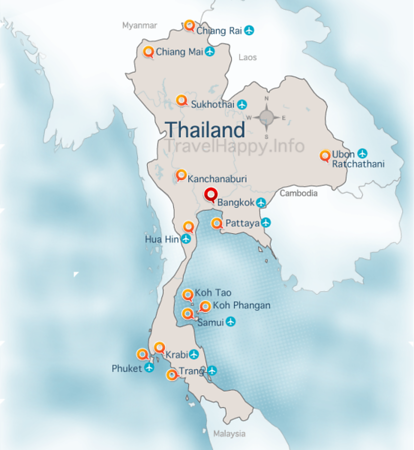 If there are any other goods in Thailand you want to know the relative price of compared to the USA and UK, leave me a comment and I will try to find out – although don’t expect it to be a super speedy response. I first went travelling in 2003 when the original iPods were still something of a rarity on the backpacking circuit – there was a sense of wonder about the iPod which I write about in Travels with my iPod.